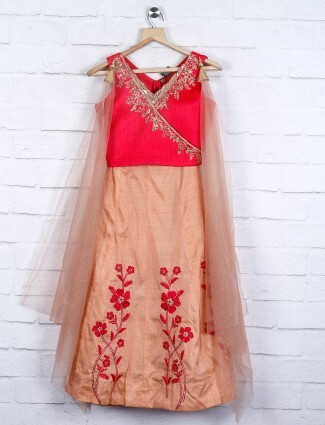 Girls choli suits being a stylish dress for festivals and weddings, be ready to find exciting and stylish designs at g3fashion.com, for girls of all ages from 1-16 years, lending them a precious look in Indian touch. Bias cut lehengas, pleated lehengas, kali concept and designer lehenga choli suits, with stunning choli and dupatta which are matching & complementing the attire. We have colours which bring the royal fusion with contemporary fashion trends and patterns in new cuts of girls lehenga choli with our exclusive brand G3+fashion creating a new line of clothing to wear for girls in weddings, parties, festivals and ceremonies to look delightful. 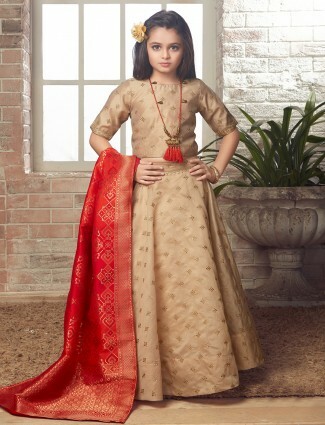 Colours in red, white, beige, orange, green, pink, blue, white, black, etc and fabrics like georgette, chanderi silk, net, jacquard, brocade, cotton, silks, velvet and embroideries used to highlight the ethnic theme being effective to show the sweetness and playful natures of the girls with Girls choli suit collection at low range and high fashion statement qualities available online with us for girls of 1 to 16 years of age. Girl's ghagra choli fall in the need to dress girls up in a party or wedding and ceremonial mood in traditional wear with new patterns and cuts, drapes and styling concepts to look marvellous at parties and events. Events which need a moderate styling element clubbed with girls choli suits, the girls party choli suits are best crafted to bring the on-trend tailoring cuts, embroideries, concepts, fabrics to make this category contain many different beautiful designs to dress your girls in a comfy yet elegant theme of ethnic choli suits. 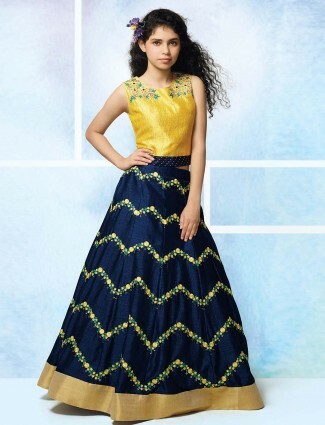 Our collection of fabrics in sober and rich look include georgette choli suits for girls in new cuts and gown concepts or cape jacket style choli suits are widely worn and appreciated. 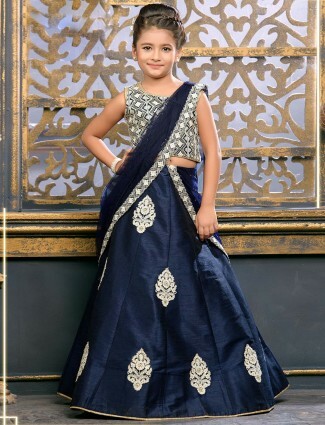 Girls net choli suits for girls of 5-6 years and 7-8 years and more find it comfortable to carry these for lighter weight, this have become very popular with our customers located abroad in USA, canada, UK, Australia, Singapore, Malaysia, Mauritius, and many others. Merging and bringing a designer concept of choli suit in colours and new pattern cuts leads to the charming ethnic elegant wear and impressionable fashion styles. Traditional look with Brocades, as the royal look for sangeet, mehndi, weddings available in sizes 1 to 16 years girls choli suits in options to choose from in trending modern color schemes and patterns. Wearing alluring designs in a very comfortable feel for all girls, would want to check in with our collection in all sizes on our site to sparkle the ethnic look at events in heavy or sober styles in girls lehenga choli online shopping. Designer choli suits for girls in new cuts and patterns with work details in thread, zari work, pearl work, stone and kundan work, diamond work, gotta work, and others embroideries enhancing the look. 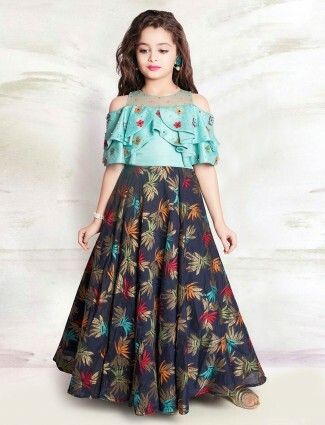 Designs in our exclusive collection has been nurtured to style girls in different types of lehenga cholis, finding what suits them best and your type of occasions you can buy online in very low costs, with free shipping and COD in India and worldwide shipping to all places. 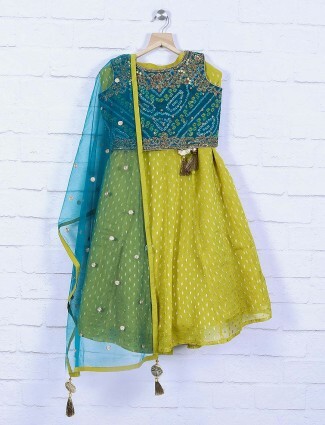 Weddings are a time to dress your girls to look like princesses in Indian wear. Girls wedding choli suits in white, red, blues, pink, orange, beige and other royal colours with detailed heavy embroidered concepts or choose a new cut and patterned choli suit for parties. All designs in a much stylish silhouette appearance in colours like, red, purple, green, yellow, black are all available for small girls of 1-2 years, 3-4 years and 5-6 years as well as bigger kids and teens. 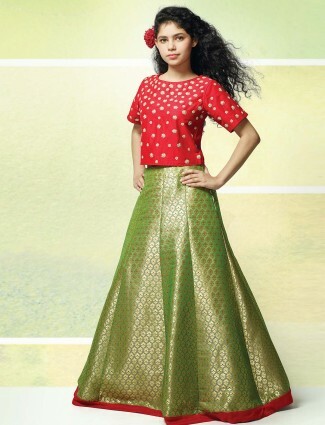 The sober net or georgette lehengas choli in border concepts to wear at festivals and ceremonies are studded and glitter in the ethnic styles to suit the fashion of the event which would suit teens of 13-14 years and 15-16 years girls. 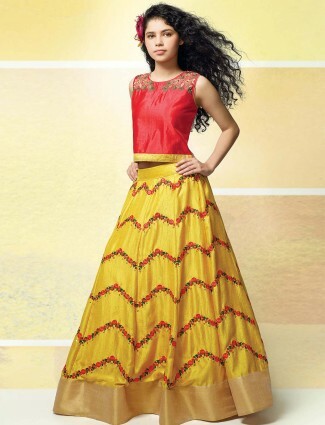 Shop for net or georgette lehengas choli for girls at g3fashion.com India's best online portal all over Bangalore, Chennai, Vellore, Ludhiana, Chandigarh, New Delhi, Mumbai, Pune, Patna, Lucknow, Noida, Kolkata, Surat, Ahmedabad, Hyderabad, and many more.